Things are slowly coming together and we are starting to get this routine down. I sometimes forget how long these things take in Kindergarten but I can definitely see a light at the end of the tunnel! We are building stamina during Daily 5, getting the hang of some letters and sounds, and getting a math routine down! Last week we continued to practice Read to Self and Work on Writing. They are getting really good at these and we are ready to add Word Work this week! I am so excited! We have also been practicing how to use our math manipulatives correctly. We are ready to start math stations this week too! Last week we focused on names! We did some awesome activities with our names to help them learn the letters in their name. I forgot to take pictures because I was busy helping them. Teacher fail! But I will take pictures tomorrow of their final products and up date this post so that you can see all of the fun! One fun project that we did was read Chrysanthemum and then they decorated their names like a rainbow. They loved it! This awesome idea came from Deanna Jump. This week we will be using our popcorn word rings to introduce Word Work! I will be assigning activities for the first week or two then the kids will be able to choose which activities they like best to practice their popcorn words. Take a peek below at what we will be up to this week. Click on the images to download the plans. 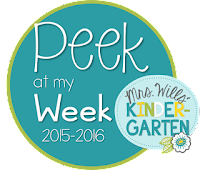 First Peek at My Week of the Year!! !